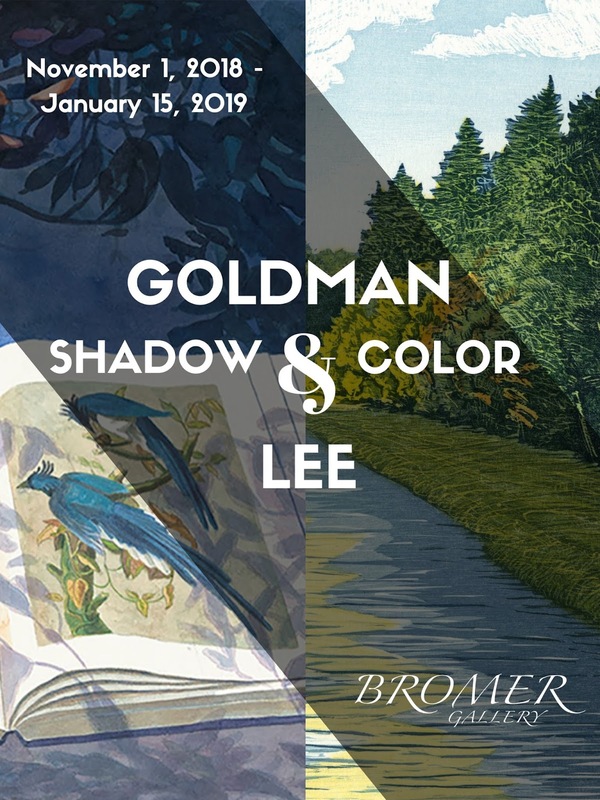 The gallery’s inaugural exhibit, titled “Goldman and Lee: Shadow and Color”, will feature Jane Goldman's watercolors and editioned prints from her Audubon Series, together with the color woodcuts of Jim Lee. The two artists are old friends who both studied with Warrington Colescott and other members of the “Madison Mafia” at the University of Wisconsin, Madison’s famed Print Department. A noted painter and printmaker, Jane Goldman will be exhibiting work from her latest series, Audubon Suite. This series of hand-painted pigment and silkscreen prints incorporates plates from Audubon’s iconic Birds of America into richly textured, vibrant still-lifes that chart the changing seasons. According to Goldman, this series “displays my abiding interest in creating a contemplative world of objects bathed in light with shadow contrasts. The cast shadows unify objects in the here and now with the 19th century Audubon image; past and present seamlessly occupy the same timeless space.” Since 1987, Goldman has been a partner in the Mixit Print Studio, a collaborative space in Somerville, MA, for printmakers. Jim Lee, the Connecticut-based printmaker, book artist, and proprietor of Blue Moon Press, will bring the lush landscapes of Ireland, New England, and Maritime Canada to the Gallery. Lee works primarily with color reduction woodcuts to capture the mood and subtle features of a particular area. As he is also interested in the people who inhabit the locations he depicts, the woodcut process allows him to weave references to their history and culture into his work. Lee’s entire aesthetic arises from his draftsmanship, and in his bookwork and prints he tries to use “the intersection of type and image as a continuation of the act of drawing.” Lee teaches printmaking and book arts at the University of Hartford. 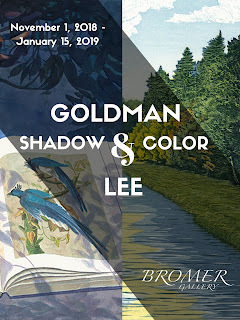 “Goldman and Lee: Shadow and Color” will be on exhibit at Bromer Gallery, 607 Boylston Street, Boston, MA 02116, from November 1, 2018 until January 15, 2019. In conjunction with the gallery show, Bromer Booksellers will feature a display of books with woodcuts from across our specialty areas. Visit gallery.bromer.com for more information.